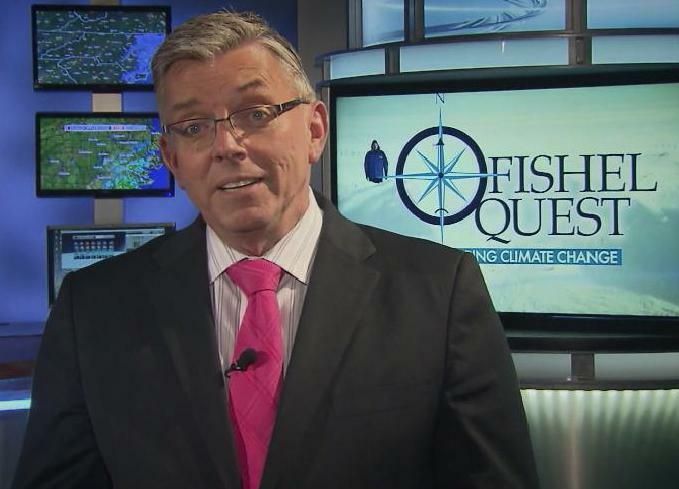 Greg Fishel, WRAL Chief Meteorolgist, has produced special reports on climate change. Broadcast meteorologists on local television have one job. It’s simple to express but difficult to do well. Predict the future, a few days at a time. To be an effective forecaster, a broadcast meteorologist has to be a scientist. And because it’s TV, she or he also has to be likable and trustworthy. Greg Fishel of WRAL is all of those things. He also used to be a global warming denier. Now, he admits he was wrong. Dave DeWitt reports on what North Carolina TV meteorologists think of climate change, and how one of them became a "convert." Fishel changed his mind about climate change after putting aside his politics and examining the science. Now, he’s an equally passionate convert, and recently expressed it again on Facebook. Fishel is in a unique position among his colleagues in the weather forecasting business. He was one of the first broadcast meteorologists to push for certification in his profession. He’s also wildly popular and has worked for arguably the most successful family-owned local TV station in the country since 1981. “Any time you have someone of high stature, high standing in the market, with a lot of credibility, it does speak volumes and it shows how important that the topic is,” says Sean Sublette, a former TV meteorologist in Roanoke who currently works for Climate Central in Princeton, New Jersey. Not all broadcast meteorologists are in the same position—or think the same way. WUNC Radio surveyed TV meteorologists in North Carolina. About three-quarters of those who responded agree or strongly agree that the planet is warming due to human activity. But fewer than half agreed it was part of their job to inform viewers about climate change. Several expressed that the political debate was too heated or that corporate ownership of stations didn’t want to deal with the controversy. Sublette says those results are not surprising. 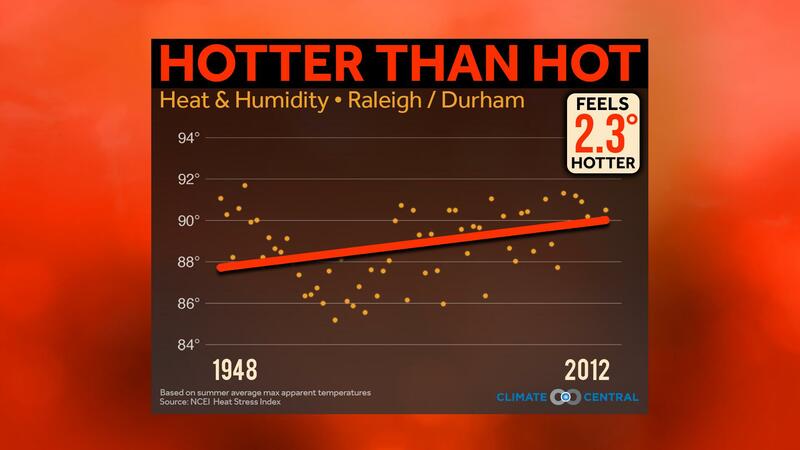 A Climate Central graphic focused on the Raleigh-Durham market. One of Climate Central’s missions is to provide research and graphics that local TV meteorologists can use in broadcasts. Even with the help, it can be very difficult to get climate information into a forecast. Lee Ringer at Time Warner Cable News does “Weather On The Ones,” so, six weathercasts an hour. Ringer does do climate change stories online. And he says he has another important, if unseen role. At WRAL, Fishel has taken that role as station scientist to a higher level. Earlier this year, he traveled to Alaska and Colorado to produce special climate change reports and has brought leading scientists to town for discussions. The other night, he says he got a call from a longtime friend and die-hard conservative. That friend said he is re-thinking his position on climate change because of Fishel’s reporting and social media outreach. Fishel says he’ll keep engaging in that discussion—on-air and online—in the hope he can lead the conversation for viewers and fellow weather professionals.